#1 Where Will You be Happiest? Perhaps the first thing you should do is really answer a few questions: Will you be happy at this school? Rather, would you be happier at schools that have already accepted you? This is a time to reflect upon what you really want. Assuming that you’re actually going to college to study, your happiness will largely depend on how much you learn, and how fulfilling the learning process is. Do you learn best when you receive lots of personal attention and feedback in class from your professor? Then an experience at a small liberal arts school might suit you better. Do you enjoy crowded lectures, where at best only a few students get to ask questions per session? Love skipping classes and not getting caught because your absence is barely detected? Then definitely consider large universities. Want to do gempaq research as a freshman? Choose niche research universities – and throw yourself at those professors at the forefront of scientific discovery. Different people have different modes of learning, and different colleges have different ways of teaching. The trick is to find the right fit. Remember that college is all about you, you, you! This decision will affect the next four years of your life, and we think you owe it to yourselves and your future happiness to be truly honest. If you decide that one of the colleges to which you’ve been accepted offers you the best fit – congratulations! Look no further, unless you decide to stay on the waitlist anyway – on a whim, for financial reasons, for parents, for your ego, for prestige. But be mindful that you might be taking a spot away from another more enthusiastic and equally deserving candidate. If you decide that you would definitely be happier at the college at which you’ve been waitlisted, DON’T GIVE UP! YOU HAVE NOTHING TO LOSE BY GETTING ON THE WAITLIST, AND EVERYTHING TO GAIN! We offer you some strategies to improve your chances. Note that we speak in generalities (e.g. #4 Sound Excited) – these are macro, big-picture objectives that we think will help you get off your waitlist. While we do provide examples of how to achieve these objectives (e.g. emailing the rugby coach), these specifics might work in some contexts but backfire in others. Ultimately, YOU will need to decide which actions are appropriate in which circumstances, and ground your goals in reality. People have different viewpoints, and different people will tell you different things. There is no one way to get off of a waitlist – so you will have to decide what the best thing to do is in your specific situation. Surveys of admissions officers suggest that less than 30% of waitlistees are ultimately accepted. Of course, this is an aggregate figure which means nothing unless we zero in to individual schools. Admissions rates of waitlistees can range from 0% (Middlebury) to 80% (Penn State), so this information will allow you to put your waitlist chances in perspective. Even if colleges can’t tell you how many candidates they will be pulling off their waitlists, they can tell you with reasonable certainty whether or not they will be going to their waitlists at all. Most colleges eventually do. If needed, you could also enquire about the process itself – Dartmouth for example pulls candidates off its waitlists in a few rounds. Some universities, like Washington University in St. Louis, are sneaky, to say the least. During my (Andrew’s) year, internationals on the waitlist did not qualify for financial aid. So be thorough – read and understand the fine print of your waitlist criteria. Scientia potentia est: Knowledge is power. Knowing your college – What are its institutional goals? What kind of students does it like? How is it unique? – will allow you to firstly show that you’ve done your research, and secondly tailor your responses to the school’s values/culture. Use this information to set yourself apart from all the others on the waitlist – show the admissions officers that you really want this: so much so that you’ve internalized the school philosophy/memorized the school anthem/fantasized about a special college event. Tell them that you’re perfect for the school, and why. Of course, do this only if you mean it – it’s quite possible to distinguish sincere infatuation from effusive flattery. This is especially important for liberal arts colleges. When these schools put classes together what they really want are people who will thrive, together, in the small and cozy environment where everyone knows everyone. They want students who will participate in and enjoy seemingly random but shared customs – and be all the happier for it. If I were a Swarthmore admissions officer I would definitely look twice at an application that mentions Sharples or Screw Your Roomate or Sager or McCabe. Tell your school that you want to study under a certain professor, or that you like how well it treats its undergraduates, or that you love its summer language school, or that you’re attracted to its student activism. Appealing to school identity, we think, therefore has a larger impact for smaller schools, where “fit” is particularly emphasized. How will you get this information? Let me count the ways. Google. Pore over your school’s website. Read the blogs of current students to better understand what a normal day in college is like. Talk to current students. Talk to alumni. Email them. Phone them. Facebook them. Search Twitter. Conversations and correspondence with these individuals can really help in positioning your waitlist appeal – and also help you figure out if you really do want this school. Do not overdo this; back off when adequate. This is the crux of this essay: only by understanding your college can you know how to ground your big-picture objectives in a realistic context. From this vantage point, you can understand how to relate your [#4] enthusiasm, your [#5] updates, and your [#6] reflections to your school. Tailor all these to your school: emphasize the relevance of your excitement, updates, and reflections in the context of your college’s values, norms, and culture. What does this mean? This means that if you find out that your admissions officers are open to more expressive writing – you can probably send them a letter with lots of exclamation marks and smiley faces!!! 🙂 If your school is known for its sense of humour, then you could tell them about a prank you plan on pulling once admitted. 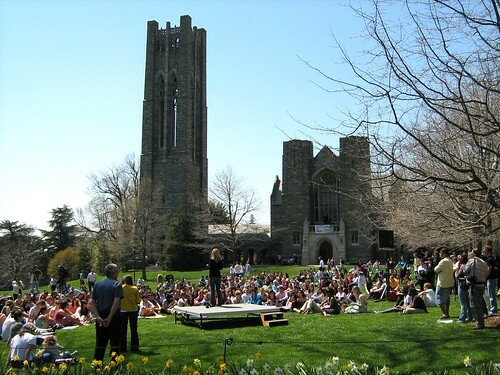 If your school is proud of its residential colleges, you can talk about how this environment is a perfect blend of socialization and intellectualism for you. If your college has a very prominent tennis team, you can send them recommendations from your coach praising you for your consistent and glowing performance as team captain in high school. If you’re a geek, and your school is geeky, tell the committee why you were meant for each other, and why you were never meant for the vibrant Greek life at the school at which you were accepted. Knowing the particular whims and fancies of such colleges can help you craft more relevant, resonant waitlist packages. Be specific – exact, concrete examples (“I want to study at a world-class institution in the morning, lose myself in the Guggenheim and the Met in the afternoon, and have Ethiopian food for dinner.”) are almost always better than vague, general statements (“I want to learn from your famous and smart professors.”). Needless to say, stay true to yourself. Do not lie to fit a certain mould of applicant, or risk firstly being unmasked as a fake, or secondly being unhappy for four years. We think the most important thing to do is to show excitement for being waitlisted, and to convey this excitement to the admissions committee! Writing back and accepting your spot is great; also make sure to express pleasure for this opportunity. If I were running a college, I wouldn’t want students – however brilliant – to not enjoy themselves at my school. Responding energetically could set you apart from all the other waitlistees. If this school is your first choice – and you will definitely attend if pulled off the waitlist, let the admissions officers know. Make your intention absolutely clear: signal your unequivocal interest in the school. All the smiley faces and exclamation marks are worth it! There are a few ways of doing this. The first and simplest way is via normal correspondence – via an email or a letter, expressing your enthusiasm for the school while you accept your place on the waitlist. Secondly, on a deeper level, you may or may not be able to form bonds with specific faculty and staff of the school. Aim to establish real, human, individual connections, not just correspondence with the general admissions staff. One can try emailing/telephoning one’s admissions officer (ideally, try to get through to the particular officer for the Asia-Pacific/Southeast Asian region), a professor with whom you’re interested in doing research, or a coach for a sport that you want to play in college. Getting to know them and explaining how you can contribute to the college could just win them over to support your application – support which may prove decisive when the school starts pulling people off the waitlist. In most schools admissions is done on a vote basis. If you win their hearts, they may root for you (and influence the rest of the panel) with all their might – and this would be a very good thing. Thirdly, you could choose to visit the school and/or request another interview. For obvious reasons this would present a financial and logistical difficulty for most Malaysian students, but the personal touch could really impress the admissions committee, if one shows important values: humility, maturity, a drive to succeed, inquisitiveness, a sense of humour. Of course, if one does not have these values, a campus visit/re-interview could spectacularly backfire. Fourthly, and if you’re feeling particularly adventurous, you could try some stunts. Stunts are very risky. One man’s meat is another man’s poison: what works for one admissions officer might not work for another. Gimmicks will definitely garner you attention, however, so you could be remembered as the-guy-who-shaved-our-college-name-into-his-chest-hair – which could be a good thing when the committee starts looking at their waitlist. Waitlistees have tried everything from sweets and pineapples to cookies and putting smart captions on photos. For some weird reason admissions officers really like poems and songs – according to this article, that is. Mailing your shoe in to “get one foot in the door,” on the other hand, elicits but a big, fat yawn. While gimmicks will attract attention to you, this attention is almost definitely not sufficient for bumping you off the waitlist. Tasteless gimmicks could imply desperation and a lack of real ability – and may end up being turn-offs instead. Firstly understand that this tactic could backfire, and secondly know that you would need to show substance (maturity, drive, boldness, determination, integrity, creativity, the good stuff) even if the stunt works. Better yet, show substance without cheap stunts. The choice is yours – while gimmicks might draw attention to you in the immediate term, this attention could detract from your individual package as a whole. Ideally, we think you should convey your message to the admissions committee without having to resort to gimmicks. As with all good things, too much of excitement can be bad. Do not go overboard with enthusiasm. Do not stalk your admissions officers. Do not be rude. Do not sound desperate. Do not sound arrogant. If your contacts sound wary and a bit hesitant in helping you out/getting to know you, back off. The ability to understand and adapt to the social context in which one is operating is an important skill, not only in terms of getting off one’s waitlist, but also in life. Do not get your parents to call your schools for you – you are young, independent men and women who are capable of doing things for yourselves. Parental intervention might suggest that your parents are more excited about your waitlist than you are, and this would be a bad, bad thing. Now is the time to update the admissions officers with new information that will strengthen your application. Tell the admissions officers about your recent developments: your academic achievements, extracurricular accomplishments, other meaningful experiences. This means that you will not be able to rest just yet – work hard! Study! Join competitions! Organize conferences! Start projects! Travel! Learn a new language! Volunteer! Do stuff! Update your admissions officers with your activities, and tell them why these activities were meaningful to you and/or society. This is really open – you can include information about your recent achievements in debate or public speaking or the Math Olympiad, or tell your college about that award-winning poem or song or symphony that you’ve composed. You can send in pictures of art work, or videos of you dancing, or pictures of the water pump that you built for that impoverished community. Tell stories about how you led your water polo team to victory, or the sense of achievement at your internship, or how you felt all warm and tingly after a particularly touching session at the old folks’ home. Note that as an individual, your time and energy are constrained. Which activities should you pursue, when the possibilities are infinite? What exactly should you do? Should you volunteer at the orphanage, work at the local bookstore, or both? Should you focus all your efforts down on one or two activities, or should you try your hand at everything? There are two schools of thought to this, and we think both of them have their merits. Firstly, depth. Focus down. Play to your strengths: if you’re particularly strong in one area, continue developing yourself in that field. If you’re a Chemistry Olympiad medalist, see if you could do further research with a professor. If you’re into journalism, think of interning with Malaysiakini or Off The Edge. If you’re a cheerleader, you could go back to school and train your juniors. The extra focus and determination may set you apart from the everyday, I-am-awesome-at-everything person. Focusing down allows you to build upon your original application, and can underscore coherence and purpose in your character. Secondly, breadth. On the other hand, trying out stuff you’ve never done before (e.g. learning a new language, starting a business, mountain climbing, a teaching stint in East Malaysia) could highlight your sense of adventure and inquisitiveness. Experimenting with different activities could emphasize a part of your character that is ballsy, adaptable, and open to new experiences – traits that are immensely valuable as an international student in an American university. Ultimately, follow your heart. Don’t worry too much about the breadth versus depth debate. Don’t do something just so that it would look good on your resume/you think it will get you off the waitlist. Do things that you enjoy, things that help develop both you and your community, things in which you find meaning – things that make your heart sing. Also, perhaps send in a better, clearer resume. Sometimes people get waitlisted because some aspects of their original application could have been better presented or explained – and this is a great chance to present the wealth of your experience/perspectives that you couldn’t fit in that little common app box. A general rule of thumb for updates: make sure the new information will significantly add value to your application. If you’ve done significantly better on a subsequent SAT test, send the scores in. If your achievement was impressive enough to merit a newspaper article, then include a copy of the article in your update. Send an update if you are truly proud of your new achievement. On the other hand, if you’re really not that good at singing, sending in a random recording might not be such a good idea. What does not add to your package as a whole may actually count as “noise” – which may annoy some officials and negatively influence your application. So be wise: choose carefully. It’s okay if you don’t have much material for this – one or two strongly written updates over the course of the few waitlist months will do. Write not only about these achievements but concentrate on why these activities were important to you. Why were they meaningful? What did you learn? What was its impact on others? A modest activity, if thoughtful and well articulated, could potentially help your application more than multiple impressive but less thoughtfully articulated accomplishments. The overarching aim here is to show maturity and insight, not just achievement. Many times committee members are more interested in what you’ve learnt, why you do what you do, or how you think than in what you’ve done. Other than personal updates, you could also send in extra letters of recommendation from your teachers, employers, or counselors. Again, only send these additional supplements in if you think they will significantly strengthen your application – lest they annoy admissions officers. Recommendations from teachers are not necessarily better than letters from employers or counselors or anyone else for that matter – what’s important is how well this person knows you, and how well he can articulate why you should be taken off the waitlist. How long should your update be? One or two pages — not too long, not too short. Be concise; don’t waste space. How often should you send your updates? On average, send one update every two or three weeks. This frequency shows interest without being annoying. This, again, is a general rule of thumb — not something you should follow blindly. This means that you should not send something for the sake of sending something. Sending an email every two weeks with no other messages other than “Hey College, I’m alive!” is not only superfluous, it is also annoying. Update only if you have something important/new to share — if you want to tell your admissions officers about some activity that you’ve done or a lesson that you’ve learnt. You do not need to send four updates about how you plan to carry out the environmental project in your school in two months’ time. For an average activity — mention it two (sometimes three) times over the entire course of your waitlist: firstly, the planning stage — what you will do, why, how, etc. ; secondly, any challenges you’re facing in terms of execution (this is optional — mainly for long-term projects); and thirdly, results/impact and lessons learnt/reflections. Conversely, if you have a lot of new/important things to share within the span of two or three weeks, send as many updates as you need — by all means. If you win a debate tournament on Day 1, pull off a project for which you’ve been planning for weeks on Day 4, place unexpectedly at Malaysian Idol on Day 8, and were interviewed on TV on Day 10, updating frequently within a short period of time is definitely legitimate and encouraged. Ultimately, you should constantly ask yourself: why you? Why should the colleges pull you off their waitlists? Think – what really sets you apart from all the other candidates? How can you contribute to that specific school? These responses are personal and very subjective – there are no wrong answers. Forming cohesive and persuasive answers to this question, however, can go a long way in gaining admission by helping you structure the rest of your waitlist package (which updates to send in, whom to ask for a letter of recommendation, etc). Generate genuine enthusiasm for life, and show drive of the mature variety. Tell the colleges about your dreams, your ambitions, your purpose in life! You could mention how you foresee yourself thriving in a school’s particular intellectual environment and how the experience could help you grow to become the individual you’ve always envisioned yourself as in the future. Spellbind the officer with your enthusiasm, motivation, and energy! An individual’s unique perspective on things is sometimes just as valuable as accomplishments because it shows how you think and how you would act according to those principles. It would be hard for him/her not to take a liking towards someone who’s so determined and resilient when he’s not even certain of admission! One could also be introspective. Have you learnt something from applying to colleges? Are you a better person from your waitlist experience? Perhaps it has taught you to deal with uncertainty – an issue that was previously extremely uncomfortable for you. Alternatively, you could also tug at the committee’s heartstrings: tell them the truth if you’ve been rejected from all your colleges and waitlisted at only one – theirs. Remember: vulnerability can be a good thing. You’re not a cardboard student figure. You’re not perfect. You’re a living, breathing young adult with dreams, ambitions, fears, and weaknesses. Don’t hide them. Don’t think that you’re not good enough for this university just because you don’t write bombast or you’ve never travelled or you’ve never done calculus. Being able to accept and reveal some of one’s vulnerability sometimes makes for a rich, compelling, winning life story. The point here is that every waitlistee should answer the “Why you?” question differently, honestly, and thoughtfully – keeping in mind the unique values and culture of the college itself. Be yourself: show the committee the real you, and let them decide. In the process, be open: you might just learn something new about yourself – and this could be a rewarding step towards personal discovery. This is by no means a complete approach to getting off waitlists. Research! Google! Do your homework! The internet is a rich source of information. Different people have different ideas. Find out the diverse strategies and approaches other people have used to turn their waitlists into acceptances, learn from them, experiment, and ultimately tailor these lessons to your own circumstances. There is no guarantee that any of these will result in the anticipated conversion from a place on the waitlist to an acceptance. But in all seriousness, in the long run, does this really matter? Psychologist Barry Schwartz argues that college admissions is already a “crap shoot,” and proposes that we select our incoming classes via lottery – to genuinely acknowledge the impact of luck on the admissions process. Getting into (or not getting into) a college does not determine your self-worth. It does not define who you are, what you will be, or how successful you will be in the future. College is what you make of it – no matter where you end up. For now, play the waitlist game. But understand that no matter how it turns out, ultimately, your destiny is in your hands: you are master of your fate; you are captain of your soul. Andrew Loh is studying Political Science and Islamic Studies at Swarthmore College. Darell Koh is majoring in Architecture at Yale University. Both of them were accepted to their colleges after stints on waitlists. We hope this helps! Leave a message/comment – especially if you are pulled off your waitlists. We look forward to hearing your stories! mid-May! i know right. but waiting reveals a lot about a person! Accepted the waitlist at Penn and Duke… Any advice on these specific schools? And I’m actually following most (if not all) of your suggestions above and will probably send a gimmick 🙂 How long should the letter of intent be word-wise? About Penn and Duke — talk to current students. I don’t know too much about them to comment. Letter of intent — not too long, not too short! 🙂 Probably 1-2 pages. Try to be concise lah; don’t waste space. Great article by Andrew and Darell. Thanks! You guys are awesome! Not applying for college yet, but I loved it. =) Somehow. I quite like the part #6 Why You? Vulnerability can be a good thing. Perhaps, I shall tell them the truth. Well, time to start the game! thanks for writing this! maybe i should play this game. hm. maybe i’ll kacau you on gtalk at some point. I am impressed with your article to assist budding msians who are much rattled by the waitlist game which is so alien to our education system. Your exemplary efforts is a rarely find among today’s youth. Equally Chen Chow’s selflessness quest to assist Gen Y msians to seek further knowledge is highly commendable. I reserved the highest accolades to you gentlemen. Believe it a not, your article kept me up till 130am though I have an assignment the next day (today). Very well written. You could make a living doing just this. From what I gathered, Chen Chow is driven to make today’s Msian youth into tomorrow’s leaders. May you all be blessed. What a challenging article! Thank you sooooo much for the info ! Good luck! Tell me how it goes! Thanks for all the information! Rereading it again, in fact. Waitlisted at Columbia University and Wesleyan University. Thanks for the article, it is helping me decompress after all of the stress of applications. After being rejected from my top choice after what seemed like having all signs point to admission, the waitlist has become a living hell that will make this next month and a half the longest and most painful experience in my life. This article has allowed me to relax and evaluate my situation, which has helped alleviate some of the stress. Even if none of this gets me off of the waitlist, thanks just for the stress relief. don’t give up rene! all the best! great article. after taking a gap year and applying to US, and then getting rejected in all but 2 of the colleges that waitlisted me, I thought my US dream was over. but this article has really lifted me up.God bless you.I am starting again. Waitlisted at Princeton, Brown and Stanford. Thanks for the article, it’s really helpful =). This is happening to me right now. I never thought it would, as I’ve told you… But it has, and I should thank you for the peace of mind and the serenity that this piece gave me. Yale Stanford Chicago Williams wait list. Converting YALE is my top priority. Wow. I’m writing this in 2013 but I just got waitlisted at Washington University in St. Louis, and I read their FAQ page about Waitlists, which said they did not expect any sort of updates or letters or recommendations, but just to wait until May 1, 2013 when they’ll know how many of the admitted students actually enroll. What should I do then?